“I’ve been more than blessed,” expresses Joanne Yeoh, 38, belonging to Malaysia, who began her journey playing a piano at a tender age of just four which ignited the love for violin in her at 8 years of age. Having completed her Bachelor’s degree with double major in both Piano and Violin, she took up Violin as her major in Master’s degree. “It was partly an economical decision as there were enough piano teachers in Malaysia, but there was an obvious lack in the required number of violin teachers. Also, as a string player, one can earn a living by playing in the orchestra,” she states. Although Joanne Yeoh is classically trained, she also plays in contemporary settings including pop, dance and rap. “The violin is a flexible instrument; it was made for classical music, but in today’s context, you can find the violin being made to play jazz, rock, crossover, pop, and even hip hop,” mentions Joanne. In August 2005 her very first solo instrumental debut album came out as ‘Pulse of the Metropolis’ which was more of an experimental endeavour to gain an experience of the entire process of making an album, and to understand the industry better. Joanne also wanted to make this album to keep as a record and reflect back when she got older. “For me, albums are likened to a publicity tool, it’s like having a very expensive name card,” she laughs. In January 2014, Joanne came up with the second album. While her 1st album comprised of original compositions, the 2nd album consisted of mainly cover version songs. Though it sounds easy to come up with two albums, she had to put up great efforts in creating the first album. Being a first timer, and having not signed under any label, she had to source out everything from the designing of the CD to getting it licensed. With the 2nd album, it took her a shorter period of time to get it out from scratch to finished product. Her academic years at UCSI University which was then known as Sedaya College, served as a stepping stone to greater things in her life. “The music department had altogether less than 30 students. It was like being in a small family. The lecturers at UCSI were always supportive and helpful in giving music lessons along with lessons of life, which essentially is what learning is all about,” she expresses. It was the Hong Kong’s superstar, Jacky Cheung’s Music Odyssey Tour in 2002-03 that proved to be a turning point in Joanne’s life where she got the chance of touring Hong Kong, Malaysia, Singapore, Japan, China, Taiwan, Brunei,USA, UK and Canada and show the world her pairing with the violin. 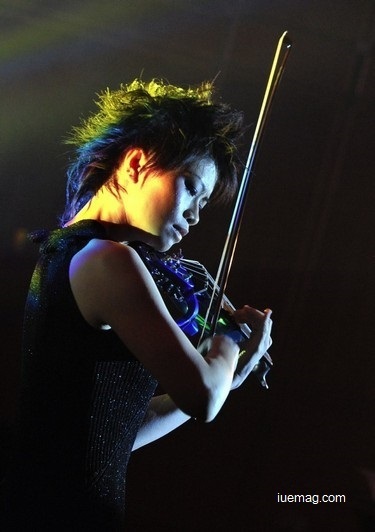 “THAT was an eye opening experience, and it kick started my career as an electric violinist,” she smiles. In February 2012, Joanne Yeoh was a part of events in India such as Launching of Suzuki Maruti Desire at Sheraton, Mumbai and the launch of Blackberry phones at New Delhi. Apart from being a superstar of violin, she is a fully accredited examiner for the esteemed Trinity Guidhall Music Examination, London which is an international examination board based at London. She is also a mentor in the Music Department at University Putra Malaysia. “I believe that education is the way forward for anyone and everyone, and I always love to be part of that process,” she mentions. For 2015, she aims to take a sabbatical from work at the university to pursue some research engagements dealing with music psychology in the UK. Any facts, figures or references stated here are made by the author & don't reflect the endorsement of iU at all times unless otherwise drafted by official staff at iU. This article was first published here on 24th April 2015.